With an eye to Saturday's Consistory – and, to be sure, these pages' general remit – it's worth recalling that this weekend's "all-foreign" intake into the College of Cardinals is set to highlight what might just be Catholic new media's most successful effort.... Yet it's predictably par for the course that, because it's not US-based, most Americans haven't heard of it. By elevating the "golden child" archbishop of Manila, 55 year-old Chito Tagle, as the Latin church's youngest red-hat, B16's adding a thumb-up in scarlet to the prelate's who's already become global Catholicism's most "Liked" major figure in social media. As of this writing, the boyish theologian's Facebook page has racked up over 100,000 fans; by contrast, the Stateside church's twin titans on the über-network – respectively, Cardinal Timothy Dolan and Philadelphia's Archbishop Charles Chaput OFM Cap. – both remain to break 20,000. 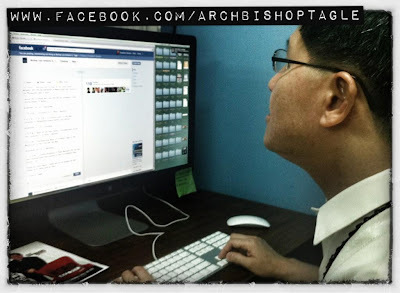 Arguably as "digital native" as a senior prelate can be at this point, the Filipino cardinal-designate – Instagrammed above as he updated his Facebook last weekend – has rooted his online presence not so much in status feeds as YouTube. Aired every weekend on local TV in metro Manila, Tagle hosts The Word Exposed, a half-hour commentary covering each of the Sunday readings, which likewise goes viral in anticipation of each weekend's liturgy – a timeliness no shortage of domestic Communications staffs can learn from (even if, among others, one good pastor already has 'em beat). Lest anyone needed the reminder, this is something the cardinal-head of a church numbering some 2.8 million Catholics – indeed, Asia's marquee diocese – does every week. And if he can find the time – and reap the whirlwind that comes of it – well, what's anyone else's excuse?